If you love Frankincense Essential Oil, then this month’s selection likely left you feeling pretty darn happy! And you know what? 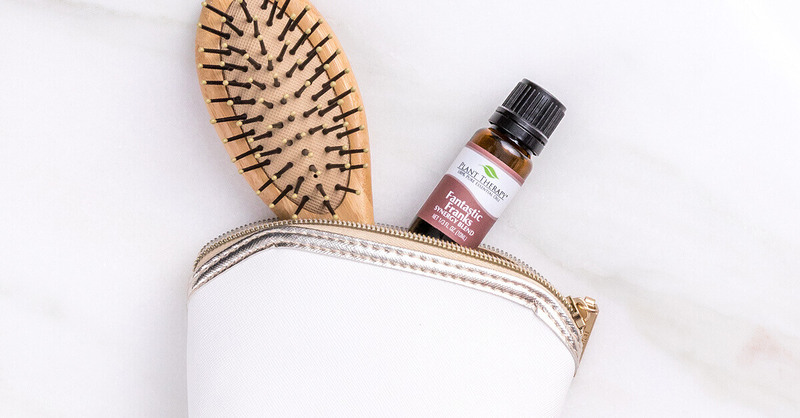 Even if Frankincense isn’t your favorite, or maybe you’ve never even given it a try before, then we hope this month gave us the opportunity to showcase just how versatile and valuable it can be in your life. 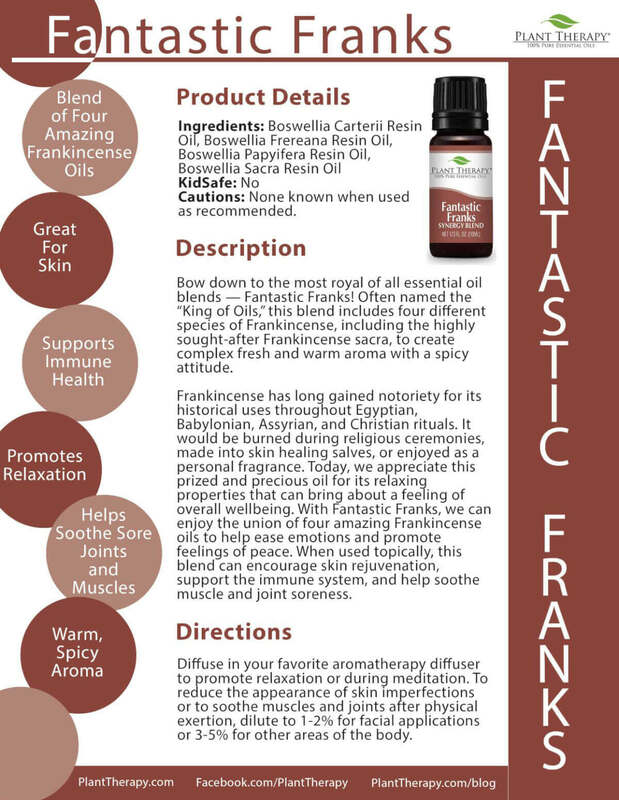 Fantastic Franks is a blend of four species of Frankincense: Frankincense Carteri, Frankincense Frereana, Frankincense Papyrifera, and Frankincense Sacra. Each species offers its own aromatic qualities and therapeutic properties, beautifully blended together for you to enjoy. The profound psychological and physical benefits of Frankincense has long been recognized by religious, spiritual, and cultural traditions throughout the world . So let’s take a deep breath (hopefully from your Fantastic Franks bottle!) and dive into all the best parts of this wonderful new blend. All people, regardless of how they feel about essential oils, can pay homage to the indisputably rich historical relevance of Frankincense. In the religious and domestic lives of the Ancient Egyptians, Babylonians, Persians, Hebrews, Greeks, and Romans, it can be argued that Frankincense is possibly the most important aromatic incense ingredient since time immemorial . It would be burned during religious ceremonies, employed as a fumigant, cosmetic, personal fragrance, and insect repellent. Frankincense was additionally a critical component for burial rituals and for embalming material, as both an offering to the departed and to mask the odor of decay . Today, we have both textual and archaeological evidence that suggest Frankincense was also used as a medicinal substance in antiquity . 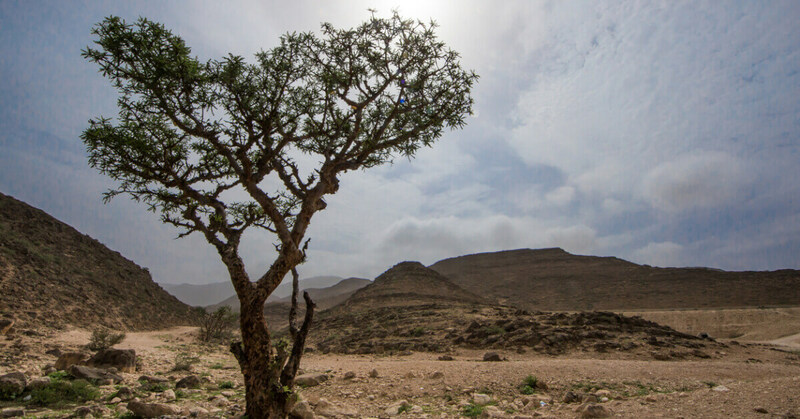 Frankincense is collected from multiple Boswellia species, which means there are several varieties available. The shrubby Boswellia trees are native to the Middle East and North Africa, and can now also be found in Southern Arabia and parts of China . When Boswellia trees are carefully cut, a gummy, resinous sap slowly pours out then hardens into an orange-brown gum, which is steam distilled for its essential oil. The essential oil retains all the woody, pungent, sweet notes of the resin from which it is extracted , though each species has its own unique character. Simply put, just like brothers and sisters may come from the same lineage and have some very similar traits, they are still unquestionably different from one another. Carteri, Frereana, and Sacra are all alpha-pinene chemotypes. Frereana typically yields the lowest levels of alpha-pinene and comes from Somalia and Somaliland. As for Carteri and Sacra, there is some debate surrounding the confusion with whether or not Carteri and Sacra are different names for the same oil. Sacra contains the overall highest levels of alpha-pinene and comes from Oman, while Carteri is not quite as high in alpha-pinene and comes from Somalia and Somaliland. And what about Frankincense Papyrifera? It’s an octyl acetate chemotype and comes from Ethiopia. If that didn’t make a ton of sense — don’t worry. Just know that all of their similarities and differences come together in Fantastic Franks for you to enjoy. 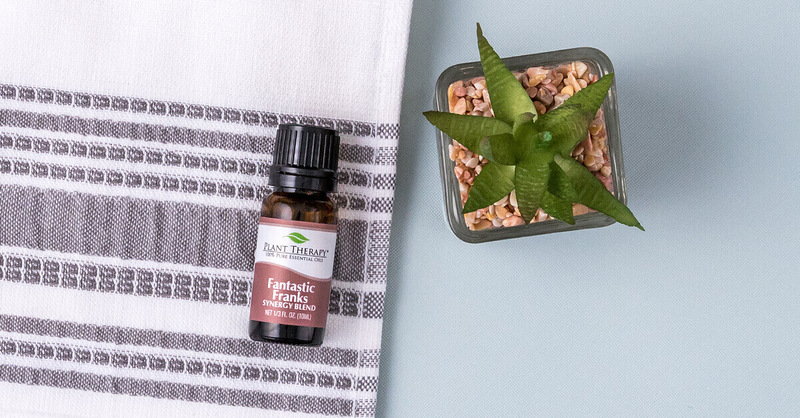 If you love essential oils that can multitask, Fantastic Franks is a perfect addition to your home. Ancient practices aside, there are many ways to use this blend. First, it is one of the most important essential oils for skin care and provides remarkable rejuvenating and healing properties . Great for anything from blemishes to minor skin wounds to aging concerns, just dilute it in a carrier oil and apply it to your face (1-2% dilution) or other areas of your body (3-5% dilution). As a gentle “balancer” for oily skin, Frankincense is thought to help regenerate aging skin, keep wrinkles at bay, and may even smooth out the appearance of some existing ones . For other topical uses, use Fantastic Franks to help soothe sore joints and muscles. Because of Frankincense’s ability to calm the nerves, it can be useful when dealing with pain and discomfort . It also supports immune health, making it great for topical application throughout the whole year! Curious about Fantastic Franks for aromatic use? It’s important to remember that Frankincense has always been prized as an incense material. If hundreds of thousands of years of recorded Frankincense use isn’t reason enough to make you want to rush right over to your diffuser and drop some in, then let’s go over a few reasons why you just may want to indulge. Today, we appreciate all species of Frankincense for their relaxing properties. One of its most important actions revolves around its influence on the nervous system, where its ability to both relax and revitalize make it excellent for supporting nervous tension and exhaustion. This makes it practical to use every day if you wish! You can call upon it for feelings of agitation, worry, and a busy brain that is overwhelmed by a disconcerting clamor of thoughts . Diffusing Fantastic Franks before or during meditation practices, or just whenever you want some personal time for reflection, can help bring about a feeling of overall well-being and peace. Frankincense may help allow you to look inward enough to cherish the past but still live, rooted and confident, in the present . It is thought to clear your awareness in order to deepen your spiritual understanding . Additionally, Frankincense is valuable for respiratory issues and is thought to help loosen mucus from the lungs . It can also help to deepen the breath and relieve feelings of tightness in the chest [1,4]. Just like any single bottle of Frankincense, Fantastic Franks is a joy to blend with other essential oils. With the warm, spicy, fresh, and clean aroma, it pairs well with essential oils that smell fruity, floral, woody, earthy, spicy, and green. This leaves lots of room for experimenting and playing around with different blends to find something you truly love! Try Fantastic Franks for a relaxing and rejuvenating bath time! Just mix 13 drops to a tablespoon of unscented body wash and add it to the running bath water. Bath blends are a great opportunity to try your hand at mixing, just try to keep the total amount of drops to 13 in order to keep a safe 3% dilution. Here are a few recipe ideas to get your blending started! Blend all ingredients together and pour into warm, running bath water. Add to your diffuser to enjoy this blend’s immune-boosting properties! To use, mix ingredients together and apply to a clean face. Use only as much as needed to feel moisturized and store the rest in a small airtight container. Cautions: Do not use undiluted on the skin. Keep out of reach of children. If pregnant or under a doctor’s care, consult your physician. 1. Mojay, G. (2005). Aromatherapy for healing the spirit: A guide to restoring emotional and mental balance through essential oils. London: Gaia. Pgs. 74-75. 4. Harding, J. (2008). The essential oils handbook: all the oils you will ever need for health, vitality and well-being. London: Watkins Media Ltd. Pgs. 126-127. 6. Worwood, V. (2016). The Complete Book of Essential Oils and Aromatherapy, 25th Anniversary Edition (Novato, CA: New World Library. Pg. 589. I just joined OOTM and definitely missed out on this one! Please bring this on as a permanent oil! Please, please make this a permanent oil!! I can’t get enough of FF!! I’m trying to ration this oil because I don’t want to run out! However if you brought it back permanently I wouldn’t have to ration….wink, wink! This is seriously my absolute favorite blend, EVER! I need Plant Therapy to bring it on permanently. Please!!! Oh man!! After reading this post I hope this oil becomes orderable!!! I’d love to have it! I was so happy to ask about this one and was able to nab one. Fantastic Franks is my absolute favorite for facial lotions now. You will be happy if you can get one of these, trust me. Hoping it will be out again soon. I’m not sure if I’ve posted for this FANTASTIC oil so if I did here’s another one!! I absolutely love Fantastic Franks!!! This is my first time with OOTM and it didn’t disappoint. Every time I look for an EO my eyes & nose immediately goes to Fantastic Franks….please, please make this a regular oil!! The smell is divine and the peace I feel when diffused is unimaginable!! I’m fairly new to PT and absolutely have quite the collection going on already (getting rid of oils from another company). I diffuse FF with a little Bergamot wowzers it’s FANTASTIC! We’re so glad you love it! Thank you for your input! Everything about this oil is fantastic. The aroma is intoxicating. By far my favorites OOTM! I kick myself that I didn’t get more than 1 of these bottles. This has been one of the best ootm. I really hope it becomes a regular. thanks for this interesting article on frankincense, now there are more options in using it. After reading all the great comments on this blend, I wish I didn’t give this a miss. After all, Frankincense is one of my favorite singles.. please bring it back as part of your regular line-up! I hope this oil becomes a regular. I think I missed out on this one!!! I am really liking this blend of Franks. I started putting it into my face serum and am really enjoying it. I also used it in a hair serum for a friend and am waiting on her thoughts. I finally allowed myself to use this oil and I love it! I am using this sparingly because it is brilliant. I made a face serum last night and it felt amazing! I love frankincense! All I have is carterii right now but I absolutely love it. I am dying to try Fantastic Franks! Please put it into regular rotation! I love, love, love this blend of Frankincense and I hope that PT decides to carry this as a permanent part of the PT line. Right now I am rationing it. I added a few drops of Myrrh and this in a carrier roll on at 2% dilution for my face blemishes. Just love it. It’s so uplifting. This was my first Oil of the Month club selection. I love this oil! So far, this is my favorite oil of the month. Please make it permanent. Im still a newbie for the OOTM. Fantastic Franks was my first oil I received. I would always add Frankincense to everything so when I got this in the mail I was on cloud 9!!! So glad I signed up when I did!!!!!! I just hope they bring it back as a regular item so I can get more. Thanks Plant Therapy for bringing us this fantastic blend! Please tell me this will be added to the product line! I was so excited when I received this. I have been searching for a quality Frank blend that includes Frank Sacra, so couldn’t believe when this showed up in my mailbox. I need more!! I am so glad I order Fantastic Franks through OOTM! I did it on the last day available because of all the hype and I don’t regret this purchase. It smells absolutely wonderful and not anywhere near overwhelming. Getting ready to diffuse immune support recipe above! I love Frankincense! Currently use frankincense from another EO company. I hope you decide to bring this on as a regular oil blend! Would love to get my hands on it! I Love this oil! My favorite thing to do with it is to put it in my diffuser necklace with a drop of Steam Distilled Lime. It’s delicious! If I join the OOTM, when does it charge my account and when does it ship? Thank you for offering this versatile blend and for your article suggesting uses for it. I’m glad I got it! Seriously my favorite oil hands down I really hope this becomes a regular. I love the idea of the face serum I need to give that a try! I hope this gets made into a permanent oil, I had to order a 2nd already! This Blend looks Amazing! I really hope that you are able to offer it for sale all the time! I love fantastic franks. I used it with Tension Tamer.. and turn it into a perfume bar and as my go to for my back ache during my menses. Smells great and good for my back. I hope PT will have this in their list of permanent products soon. I’ve never really been able to tell too much of a difference between all the Frankincense variations, but I love that all of them are blended together here! I wish they were all organic though. Will this oil be sold to everyone? If yes, when? Would love to try it. So thrilled that you have created this blend of all the franks! I’ve seen other brands offering the blend and always wanted to try them. Love your variety of having them available in singles and now the blends 🙂 Will definitely try this. Do you use any organic frankincense oils in this blend? I love this. I sooooo wish it was kidsafe! Because it is not, I had to give it up! Fantastic Franks was my first oil when joining the oil of the month club. I was so excited when I opened my green package as Frankincense is one of my all time favorites. And to have all the franks together in one oil of amazing. I’ve been adding it to my facial serum along with lavender and love the smell and results I’m getting. Thanks Plant Therapy for another awesome oil! We’re so glad you’re loving it, Jessica! So cool to see all species of Frankincense together in one blend! I’ve been using Frankincense in my face oil every morning and evening and feel like my enlarged pores are minimizing, and some acne scarring is clearing up. Excited to try this one in the future and get the benefits from all the varieties. So glad I got to add this oil to my collection!!! I didn’t think I liked frankincense to be truthful… until this blend! I love it in the diffuser all by itself. I haven’t even tried blending it. I hope you add it as an oil that can be purchased anytime, since it seems to be such a huge hit and has apparently sold out I can’t even get a spare bottle! I love this blend! I diffuse the recipe from this blog with Fantastic Franks while doing yoga. I ordered an extra, but now I’m wondering if I should have ordered more! This is my new favorite oil. I use it on my face and in my calming blends. I love Frankincense but this is by far my favorite. I was so excited when I opened it and saw it. Then I smelled it. Amazing. I hope they carry it all the time. LOVE IT! Younger glo is a fantastic choice for this blend! I was so unbelievably happy to receive Fabulous Franks last month- I couldn’t wait to use it. I made a healing skin salve with FF and some other oils combine with hempseed oil. Works wonders on damaged skin! We’re so excited you’ve decided to join our OOTM family! Well this post alone lit a fire under my bottom to join the Oil of the Month club! I don’t want to miss another great oil like this one! I am sad I missed out. Hopefully there will be a great demand for it and will be available for purchase. I love frankincense, use it every day, and this is my favorite by far. Bought two extra bottles as back-ups and would LOVE to see it become a regular offering. So glad I got in on ootm. Finally. Fantastic Frank is, well fantastic in ever way. I Luther smell, it makes me feel good, I can’t wait to try it for my face. I’m a fan for sure. I recently got this oil this week as part of the oil of the month club, which I finally joined last week, YAY! I am so excited to start working with this oil for homemade products for the face and body!! The aroma itself is amazing. Thanks PT for being awesome. We’re so glad you love it, Miriam! One of these days I’ll be able to join the Oil of the Month club! I would love to try this one. Would it be okay to use this for any recipe calling for any variety of frankincense? I hope this is available for purchase sometime in the future! This an awesome blend of franks. I bought a second bottle. Hope PT begins to carry it. I got this oil blend and it fabulous! It definitely has the frankincense aroma. What i love best are its benefits for skin! I made the face serum and it really makes my skin look soft and flawless. This is THE BEST Oil of the month I have received so far! I only picked up one bottle so I’m really hoping that this becomes a permanent offering in the future. I need MORE!! I am so excited!! I just joined this evening. I can not say enough great things about PT. I am so happy to have found you guys!! Awesome ideas! Im enjoying the blend so far and always love new suggestions! Love this in a face moisturizer! I missed this! So sad! I hope to sign up for oil of the month soon!! Am LOVING this blend! Is it safe to diffuse with children around? I have been using it only in my bedroom, but would like to use it elsewhere. So you’ve peaked my interest, if I don’t like the oil of the month can I still use the free return policy? I love the smell of frank from Somalia but Oman not so much. I was sooo excited when i got this in the mail!!! Of all of my oils I use Frank C the most, it is my favorite! So I was so very excited to receive Fantastic Franks as my first Oil Of the Month Subscription oil! I am so happy I subscribed when I did, and didn’t miss it! 🙂 Thanks, PT! This oil sounds amazing! Can’t wait to try it once my kids are old enough. I made the face serum from this blog and I have to say it is awesome!! Can’t wait to try the Fantastic Franks in other recipes! I finally caved and ordered this Oil on the very last day of the month! After reading the reviews on the facebook OOTM group, I am excited to get this oil and see for myself what all the hype is about! Franks Fresh and Fabulous Face oil, love it! Made it after the live video, use it every day after my Younger Glo face cleanse! I’m 62 and need all the help I can get. It isn’t oily, goes right in and smells amazing! I do have to say I added a couple drops of Ylang Ylang Complete! We are so glad you love the recipes! And that added touch of Ylang Ylang sounds wonderful — thank you so much for sharing! I love Frank for so many different uses and am so interested in trying this blend! So glad I joined in time to get this. I love it! Such a great blend! I made a roll-on with avocado oil and I just love it! I had to buy a 2nd bottle just in case it’s not for sale for a while. Please add this oil to the regular lineup! I ❤ this oil and got 3 bottles of it. Thank you Plant Therapy! We’re so glad you love it, Karen! I didnt lnow you could order more than one bottle since it doesn’t let you change the quantity??? I love it & want more!!! Ordered two and so glad with my purchases! I love this oil! So many different uses. I received this as January 2019’s OOTM and I absolutely love it! I love the regular Frankincense I have, but this tops the cake. The scent is beautiful and the benefits are amazing. I’ve been using it in a face serum as well as diffusing with other immune boosting oils with all of this flu and upper respiratory issues going around. Love this blend! I’d love to make the bath blend, but when I used carrier oils for my bath, it left the whole tub greasy. Is there any way to make a bath blend without leaving residue? This is by far the most favorite of all the OOTMs that I have received. PLEASE, PLEASE, PLEASE consider making this one permanent. Absolutely LOVE it!!! It sounds like this oil is a must have. I can’t wait to try it! Received this as an OOTM, and purchased a second bottle. I love not only the smell but all the benefits are amazing. I really hope this becomes a permanent blend. This is awesome! I’ve been interested in Frankencinse for so long and it looks like I’m finally gonna be picking up some with this blend! Technically Carterii and Sacra are not separate species, but different origin countries and chemically different. This blend smells amazing. I love the new Fantastic Franks synergy! I can’t wait to try the bath blend but I am going to try a twist on it for the shower. Instead of adding to bath water, I am going to put it in a foaming pump bottle and top off with distilled water to make a Frankly Sane foaming bath wash. I signed up yesterday for OOTM just for this! I’m very excited to try it. To get all the benefits of the different frankincenses in one bottle is really exciting. This is, by far, my most favorite blend! I couldn’t wait to start using it as soon as I got it. I’ve been using it in my facial moisturizer at night and the results are amazing! As I’m getting older I’ve started getting breakouts that just don’t go away and leave scars. I feel like my skin is having a mid-life crisis! Lol Since using this blend, those stubborn pimples are gone and the scars from others are fading. I can’t wait to try the bath blend next! I’m so happy rhis was my fiesr OOTM purchase. I can’t wait to experiment! I love this oil. Great way to try different types of Frank. I’m so glad I joined the OOTM club just in time to get this oil! Love it!! This is a great article. So much valuable information. Pursuaded me I need to get a bottle. I love my Fantastic Franks.. I plan to order another bottle or 2 provided it’s still available. Well Done Plant Therapy.. As always.. Please make Fantastic Franks a permanent oil! LOVE LOVE LOVE this blend!!! I made a blend with Fantastic Franks, Davana, Ylang Ylang and it is absolute DIVINE!! I call it Frankly Davana! Really hope this becomes a regular blend! Thank you so much for sharing, Rebecca! That sounds wonderful! This is one of my absolute favorite essential oil blends. I ordered 2 more and hope it is kept available regularly. It smells fantastic and is good for so many things! I haven’t received mine yet bit can’t wait to try it!! It will probably be frozen when it gets here to Indiana because its -40 wind chill here.⛄️ so should I keep it in the fridge? Mine was rather cold when it arrived yesterday. I left it to warm slowly last night. It smells heavenly! I would love for this to become a regular product. I am in love with it. I am practically a frankincense junkie (I own 6 different frankincenses now), and Fantastic Franks is absolutely my favorite of all! It has that nostalgic medicinal aroma of frankincense carteri, and it is rounded sweetly by other frankincenses. Actually, I think I am going to order another bottle before the month is over! That’s great! We are so glad you love it! I can’t wait to try this blend! So excited!!! This is my ABSOLUTE FAVORITE product available from PT. The smell, the benefits, the name…all of it. I have used almost the whole bottle this month in different products, so I will most definitely order another one. BRING IT ON AS A PERMANENT PLANT THERAPY!!! I can’t find how to order Fantastic Franks. You can contact customer service. These are ordered through a programme called Oil of the Month. It is a mystery oil for the past many weeks for all of us here. Just 2-3 days ago, unless you received it already, the name of this oil is made known through oil of month club. So excited to try this. I’m new to oils but read an interesting article just today. Someone asked for suggestions for their first order. The first 10 responses I read all said frankincense. Wow! We are so glad our customers are loving this blend so much! I really hope this blend makes into the Plant Therapy regular line up It is amazing! *orders immediately* can’t wait to give this a try! LOVE frankincense! And Fantastic Franks is–fantastic. The scent is wonderful. Thank you for the history and information on the different species. A powerful oil for sure! Oh, I hope this becomes a regular. I currently purchase the three Franks PT sales and mix them together. I call it Mom’s Miracle and I use it for everything! I love frankincense! I try to get as much as possible! I am excited to try this! I was so excited about this oil that I had to order a second one! I just adore Frankincense and I hope this blend of the four different franks does become permanent! Awesome! I am so excited to order this! I love Frankinsense! Never thought about it for pain….trying that recipe in the bath tonight. Using it for my face serum, I think it helps my acne scars. Loving my Fantastic Franks order. It seems to be the perfect addition to any blend I make. Great scent, not too over powering. So glad you blended them all together. I received my Fantastic Franks earlier this month from the OOTM, and I absolutely love it! Plant Therapy knocked it out of the park on this one. I just ordered this! I can’t wait to try it! I would love to get frankincense to apply to my thyroid! Awesome! Can’t wait to try it. This is such a cool idea! I really hope that this becomes an ongoing product. I would definitely buy it!!!! Mine just has shipped and I cannot wait to receive it! I love Frankincense so this synergy is a dream come true! This is BY FAR my favorite oil! I pray that this will become permanent!!!! I am extremely excited to try this as I use Frank in almost all of my blends! Such an interesting article, I can’t wait to add this blend to my collection. Awesome idea to blend all the Franks! I will be ordering this soon! My favorite Frank so far has been Frereana.